Play Exhibition games to earn cards to build a better deck. In Exhibtion games you face off against another user's Exhibition Deck. The strength of your Exhibition Deck changes your Exhibition Tier Rating. This determines the Rewards you will be competing for. Exhibition games award Picks, 2 for a win and 1 for a loss. Each Pick removes one card from the board. The board will Reset on selecting a boost or any card rare or better. King of the ring matches you up with 15 other players to compete for the championship and earn powerful rewards. Matches are simulated. During Active times your king of the ring deck is in the ring during inactive times you can manage your superstars for the next game. Active superstars lose stamina each game. Inactive superstars gain stamina each game. Alignment is used for Tag Team Matches. Complementing alignments are good tag team and receive a stat bonus. Conflicting alignments are poor tag team and receive a stat penalty. The strength of your king of the ring deck changes your king of the ring tier rating. This determines the rewards you will be competing for. As a Superstar's Stamina goes down they don't compete at their full potential. 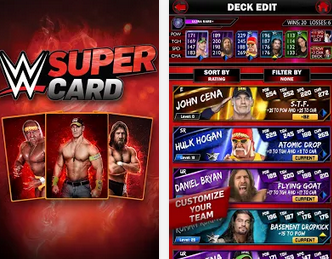 Drag and Drop Energy cards collected from the Exhibition games to restore a superstars stamina. Earn Energy cards from exhibition games. Use Energy cards to refill superstars stamina during king of the ring. Use Boost cards to increase superstar stats during the Next game. Only one of each boost can be active at a time. Use an assistant manager to restore a superstars stamina automatically between games. My Cards lets you browse Superstars you've collected, train your superstars to improve their stats, and combine superstars to make powerful Pro version. The better the superstars selected the more the trainee's level increases. All selected superstars will be removed to make the trainee stronger. Train your superstars to strengthen your exhibition deck and improve your chances in King of the Ring. Two of the exact same superstars can be combined into a pro version of the superstars. When Combined both superstars are lost and a new superstar is received. Pro superstars have better stats and a higher Full potential. Combine Max Level Superstars for the best Full Potential.